When you’ve been around for 10,000 years, you’ve seen a thing or two. 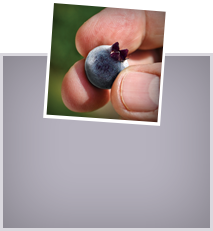 Wild Blueberries are one of only three berries native to North America. The continent’s earliest inhabitants were first to use the tiny berries, both fresh and dried, for their flavor, nutrition and healing qualities. In fact, Native North Americans believed the Wild Blueberry had magical powers. Atop each Wild Blueberry is the base of its earlier flower, a calyx in the shape of a five-pointed star. Legend has it that during a time of starvation, the Great Spirit sent these “star berries” down from the heavens to relieve the hunger of his children. These early inhabitants were the first to burn their Wild Blueberry barrens to encourage the growth of new plants. Centuries later, settlers arriving in the New World acquired some of these ready-made barrens and were taught the many uses of Wild Blueberries. Wild Blueberries were first harvested commercially in Maine during the Civil War, when they were canned and used to feed the Union Army. They have been a mainstay of the region’s economy for well over 100 years.